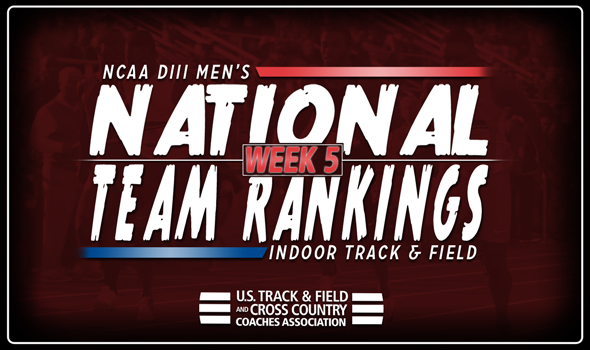 NEW ORLEANS – The first batch of NCAA Division III conference championships passed by and with it, shook up the most recent Men’s Indoor Track & Field National Team Rankings that were released Tuesday by the U.S. Track & Field and Cross Country Coaches Association (USTFCCCA). Top-ranked North Central (Ill.) and No. 2 Mount Union strengthened their positioning atop the index, while only three of the remaining 23 teams remained in place from Week 4. Last week’s No. 4 Rowan led a charge of top-10 teams that all moved up one spot. The Profs went up to No. 3 and are followed by UW-La Crosse (up one), MIT (down two), UW-Whitewater (up one), Christopher Newport (up one), Benedictine (Ill.) (up one), UW-Oshkosh (down six) and UW-Eau Claire (up four). Benedictine (Ill.)’s rise coincided with the performance of Jordan Johnson this past weekend. Johnson, who was named National Athlete of the Week earlier in the day, turned in the nation’s top time in two sprint events: the 60 (6.79) and 200 (21.52). UW-Eau Claire cracked the top-10 once again following a weekend that saw David Kornack and its 4×400 relay team tally strong marks. Both are ranked second in the nation as the relay went 3:14.55 and Kornack threw the shot 17.17m (56-4). There were six teams that moved up four or more places this week, including the Blugolds. Wartburg jumped from No. 21 to No. 14, Williams from No. 24 to No. 19, Ramapo from No. 27 to No. 20, Widener from No. 154 to No. 23 and Middlebury from No. 38 to No. 24. This is the best ranking of the season for Wartburg as it continues to climb. The Knights started the season in 97th and upped its billing all the way to No. 14, its highest rank since 2016. We’ll have two more sets of rankings in advance of the 2018 NCAA Division III Indoor Track & Field Championships, which are set to be held March 9-10 in Birmingham, Alabama.